The first thing you might notice is that we added a lot more scriptable object types. We used to have a FlashArray, a FlashArray connection, a volume, a host, a host group, a protection group and a snapshot. Remote FlashArrays (a representation of a FlashArray that is being replicated to). Protection group snapshots. This is a collection of snapshots that have been created by a schedule in a pgroup. Deleted objects. When you delete a snapshot or volume or protection group, it goes into a recycling bin for 24 hours. We give this a special object designation to make it easier to manage and see them. The nice thing about having these as actual object types in vRO, is that when you make them an input type to a workflow, a user can select it from the inventory. Like you would choose a VM or datastore. This makes it much easier to use and also allows software like vRA to import them and allow end users to “own” them. This is one of the really important benefits of having a plugin over just having a workflow package (though building packages on top of plugins is great–my VVol workflow package is coming soon!). In v1, we had 74 actions. Create a volume. Snapshot a volume. 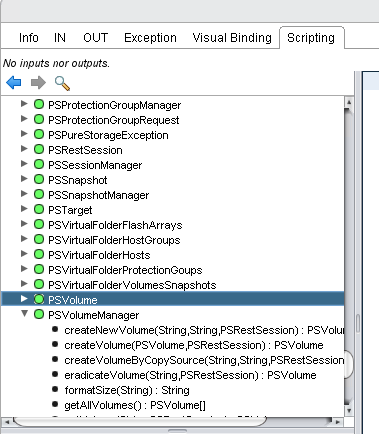 Find the volume for a VMFS datastore. Etc. In v2, we have 171 actions. 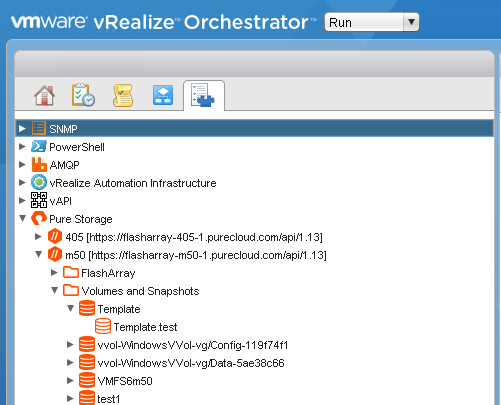 If there is a process you need, or a correlation, or want to find out what items are related to another item on the FlashArray (or how a FlashArray item relates to a VMware one) there is likely now an action for it. Drag and drop it into your workflow. The most obvious enhancement is of course new workflows. Add Datastore to existing cluster. 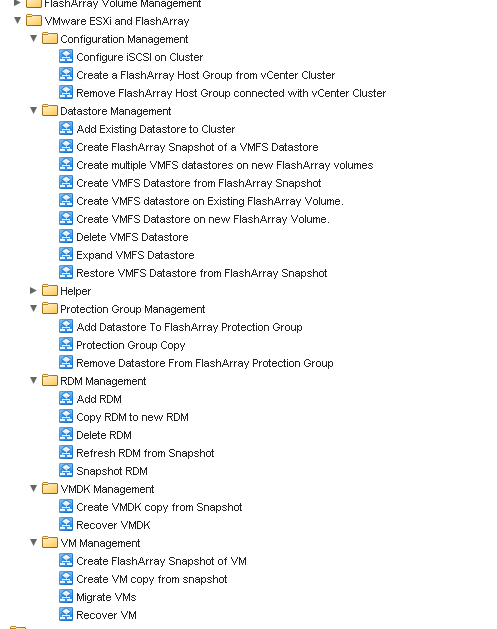 This takes an existing VMFS datastore and a cluster and connects it to that cluster. So it figures out what volume is that VMFS, connects it to the right host group, then rescans the hosts so it sees them. Create multiple new VMFS datastores at once. Protection group copy. This is a cool one. If you have a protection group snapshot with copies of a bunch of different VMFS datastores, you choose the point-in-time and the workflow will copy the snapshots to volumes, present them to a cluster. Resignature and mount them. Then it will look for an VMs on those datastores and register them. Copy an existing RDM and present a copy to another VM. Refresh an RDM from a FlashArray snapshot. Create a FlashArray snapshot of an RDM. Create VMDK Copy from Snapshot. This takes in a VM, a VMDK a snapshot and then a target VM (could be the same or different) and brings up a copy of that VMDK and present it to that VM from that past point-in-time. Recover VMDK. This is the same workflow as above but instead of creating a copy, it replaces the existing one with the previous version. Create FlashArray Snapshots of a VM. This allows you to use VMtools to quiesce the VM and then create a FlashArray snapshot. Create VM copy from snapshot. This allows you to clone a VM from a FlashArray snapshot. While you can clone a VM in VMware, this allows you to clone it from a past point-in-time and since it is snapshot based, if the VM is very, very large, it will be much faster than even a VAAI XCOPY clone. Migrate VMs. This is basically a SRM test failover OR a failover. It takes in a set of VMs, and then syncs its replication to a target FlashArray and then recovers the VMs on the target cluster on the target FlashArray. Recover VM. This recovers a VM from a past point-in-time in a snapshot. Phew. There’s a lot in this release. Stay tuned as I put out some demos and other posts about what can be done!